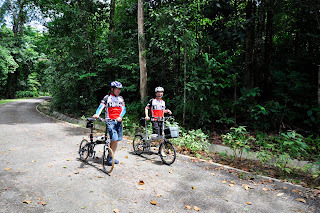 After logging about 50km on Sunday during the CNY ride with LovecyclingSG group, I can now safely say that the X9 shifter + X9 RD combo is working really well. From steep downslopes to steep hills, the derailleur has not missed a single shift. The RD shifts the chain precisely onto every sprocket without error. Coupled with the SRAM cassette and chain, the gear changes can be very quick, usually requiring only half a revolution of the cranks. This is especially useful when downshifting under pressure. I am also getting used to shifting without using the gear indicator, and shifting based purely on effort and feeling. This normally works well, except when I am nearing a traffic light and I need to downshift so that I can move on later. I will not know how many gears I need to downshift as I am unable to tell what gear I am currently in. Also had a good ride along Mandai Road, with the undulating terrain challenging and exhilarating at the same time. Great to blast down the road at almost 50km/h on the downhill, and work hard on the long slopes.